Friday was the hospital appointment I wasn’t looking forward to – the glucose test, to check for gestational diabetes. For those of you who haven’t been subjected to one of these, they vary in length, from a one hour to a three hour test. The standard at my hospital is a 2 hour test, with a series of blood tests and possibly the most disgusting drink ever. So, let’s begin at the beginning. Booking in for this test I was told to arrive as early as possible, and in the words of the midwife, “pathology opens at 7:00am, but people start arriving at 6:30am”. Great! Sounds fantastic – I would love nothing more than getting up at the crack of dawn to drink horrid crap and be drained of blood. Let’s go! Adding to this was the fact that I had to fast from 10:00pm the night before. So let’s sum up: take one pregnant woman, deny her food, make her get up crazy early, drain her of blood and ask her to wait for 2 hours. Awesome idea! So that was pretty much the glucose test, in a nutshell. I had to get a blood test, then drink basically a bottle of sugar syrup (like lemonade to begin with, then like the most disgusting thing ever, then worse). I then waited an hour, had another blood test, waited another hour, had the last blood test. Then Mr Nester and I had breakfast out. I bloody well earned it! I don’t find out the results until sometime this week, and if I hear from the hospital, it means I failed the test. They won’t call if I passed. So that means hoping my phone doesn’t ring until Friday, when I should be in the clear. 3D!! I got to see a proper shot of my beautiful girl! She definitely has her Dad’s lips, and it looks like my widow’s peak as well. So exciting! Mr Nester and I were completely blown away. I spent pretty much the whole weekend just staring at this picture. 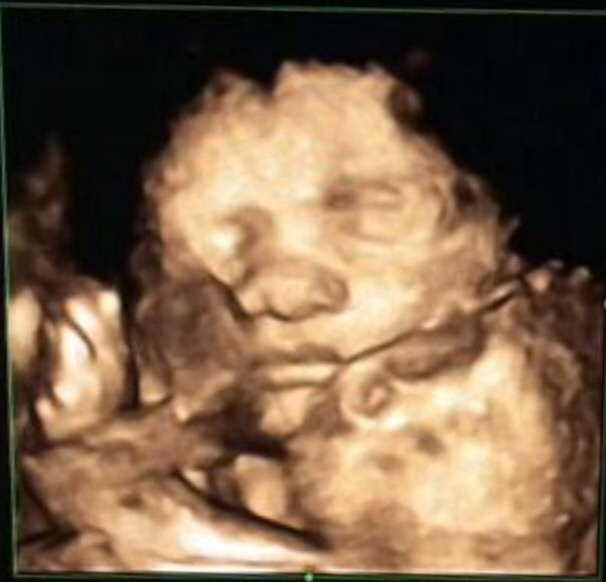 The added bonus is we get to see her again in 8 weeks for the next scan, then a month after that she’ll be here for real! On that smitten note, I’ll leave you until the 29 week update, coming soon.